Two Springs ago I received a call from the Dean of the College of Arts and Sciences. He offered me the opportunity to lead the University of Virginia’s Institute of the Humanities and Global Cultures. I was then ten thousand miles away, in my Australian home at the foothills ofthe Brindabella Mountains. Global travel had become second nature to me these last two decades. My urge to beat the tyranny of distance that was Australia generated many transoceanic journeys. The United States was a frequent destination, as were countries across Asia, Africa and Europe. But Canberra with its gum trees, kangaroos and red rosellas was always home. Was I ready to leave Burley-Griffin’s exquisitely planned city and relocate to Jefferson’s birthplace? I guess I was. For here I am now, comfortably ensconced in the majestic environs of this historic University, and primed to plunge into this most fortunate of assignments: to regenerate and build a community of scholars and students attuned to the global calling of the humanities in the twenty-first century. To say this has been a rewarding year is to understate the riches that have come our way. UVA’s extraordinary strengths in the humanities and the liberal arts are visible everywhere. Not for nothing did the National Endowment of the Humanities choose our University to host its golden jubilee celebrations. From the opportunity to participate in the fiftieth anniversary of the NEH with its headline speaker Sir Salman Rushdie, to hosting writers like Amitav Ghosh, and scholars like Michael Hardt, Amanda Anderson, Bin Wong, Laurent Dubois, and Sandro Mezzadra, not to mention partnering in the Academy in Global Humanities and Critical Theory with the University of Bologna and Duke University, it has been an invigorating adventure in the company of distinguished humanists, younger colleagues, graduate students, undergraduates, visiting scholars, and our indispensable program staff. My arrival coincided with a generous grant from the Andrew W. Mellon Foundation to establish a five-year program of faculty hires, fellowships, and laboratories on the Global South. 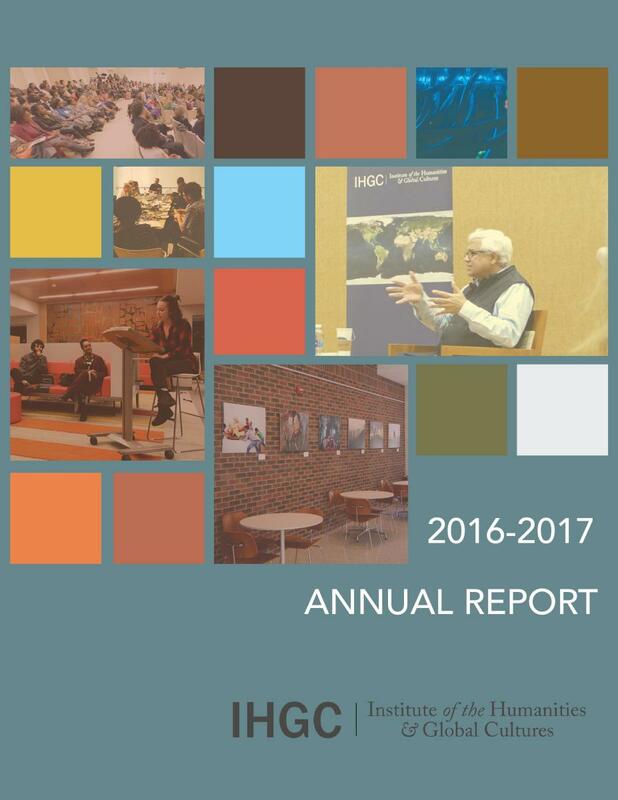 A rubric that explores myriad sites of knowledge-making not limited to northern and western hemispheric modes of thought, the Global South offers exciting opportunities for research and curriculum advancement aptly suited to our rapidly changing world. In a short period of fifteen months, we have built a cohort of fifty faculty and students engaged in projects on African urbanisms, Indian Ocean commercial and cultural worlds, transatlantic histories, comparative cartography, aquatint empires, Franco-Arab, Latin American and South Asian literatures, Brazilian media, surveillance cultures, pre-modern religious pluralism, silk trade in the pre-modern Mediterranean, global water, contemporary wars and humanitarianism, Islamic philosophy, and environmental post-humanist thought. Our undergraduates celebrate “Humanities Week” every Spring through their creative and scholarly endeavors. This year they focused on the idea of inequality – a fraught theme that has resonated through the election year. Inequality or rather “1% Privilege in a Time of Global Inequality” is also the theme of a photographic art exhibition we hosted, curated by Time Magazine photo editor, Myles Little. Our students, under the guidance of our wonderful Program Administrator, Anne Gilliam, wove their events around this exhibition and hosted panels, photographic contests, simulations, poetry workshops, and films. They worked with local artists and activists, and brought to life a vision of public humanities that did us proud.